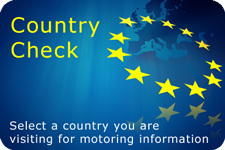 Products Driving in Europe - Are You Legal? 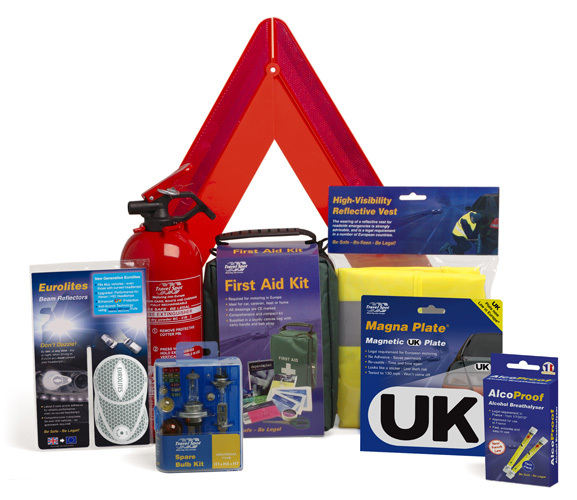 [Click image to close] Ensure you comply with European Motoring Requirements by carrying the following essential items of accident, emergency and breakdown equipment. Headlamp Beam Adaptors: Failure to adapt your headlamps at any time, day or night, will render your vehicle unfit for use on the road and could invalidate your motor insurance. Alcohol Breathalyser: From March 2013, all vehicles travelling in France MUST, by law be carrying NF Approved breathalysers. GB Plate: A GB plate must be displayed on the rear of your vehicle, caravan or trailer. Spare Bulbs: Drivers must be in a position to replace any blown exterior light. Warning Triangle and Reflective Vests: Motoring LAW in France and many other European Countries now requires all vehicles to carry a Warning Triangle and a Reflective Vest. It is strongly recommended to carry vests for all vehicle occupants, as is LAW in Spain, where TWO triangles are also required. The French Société Prévention Routière (Road Safety Department) strongly advise carrying reflective vests for ALL vehicle occupants. 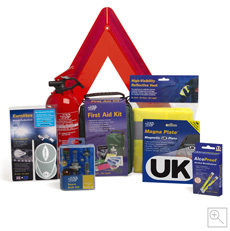 First Aid Kit and Fire Extinguisher: The European Good Samaritan Law requires every driver to stop and provide assistance in the event of an accident, so it is strongly advisable to carry these items. DriveRight® - Lane Safety Device: The simple transparent windscreen sticker that helps you to drive on the RIGHT side of the road. 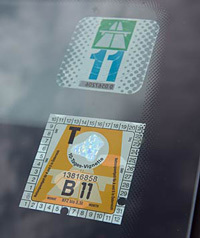 Most drivers are already familiar with the French ‘pay as you go’ Motorway network (Peage) with its payment toll booths. However, drivers should also be aware that Road Toll Cards (also known as Vignettes) are used in a number of European countries, including: Austria, Bulgaria, Czech Republic, Hungary, Moldova, Romania, Slovakia, Slovenia, and Switzerland. In most of these countries a coloured ‘Toll Paid’ sticker has to be purchased and applied to the vehicle windscreen. Vignettes are generally available from border crossings, petrol stations, and other outlets. Be Aware: The fines for failing to purchase a Vignette can be extremely high (we heard of one case of a campervan and trailer driver being fined 900 Euros for not having one!). For detailed information on different country requirements please visit Wikipedia. In France AND Germany it is illegal to be in possession of a radar detector, even if it is not fitted or being used and the police can issue heavy on the spot fines and confiscate any equipment. Travel Spot's advice is to remove both the fittings and the radar detector from your vehicle before driving in either country.